Introducing Mrs. Jackie Silvers, R.N. Mrs. Jackie Silvers, R.N. is a very recent transplant to the Tampa area having been born and raised on Long Island, NY. She earned her A.A.S. in nursing from Dutchess Community College in NY. 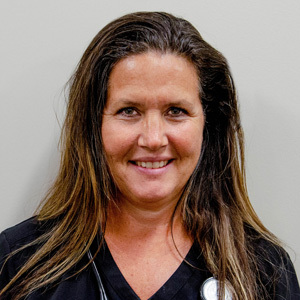 She has been a nurse for nearly 30 years with over 10 years experience in school nursing. Her most recent position was in a private school with a student body of 750 grades PreK-8th. "What I like most about school nursing are the students and "fun Friday," something I would like to continue at Carrollwood Day School. I am so very grateful to have the opportunity to work alongside what appears to be a very happy and professional group of people." On a more personal note, she and her husband were married in England and have two grown children and two pets. Having lived outside the "Big Apple" all her life she has been fortunate to have enjoyed its kinetic energy from theater and museums to street carnivals and parades. She is eager to see what Tampa has to offer. A Miami Dolphins fan as well as a NY Rangers fan, she is looking forward to seeing a few Lightning games. Mrs. Silver enjoy sports, travel and outdoor activities particularly hiking. She is super excited to explore Florida, however she admits to being a little intimidated by the bugs, snakes and gators-oh my! Live life when you have it. Life is a splendid gift- there is nothing small about it." Over winter break, the school clinic relocated to a larger space on the elementary campus. You can find Mrs. Silvers getting settled in at the new clinic in the Spanish/Art suite.